These new appliers from Pink Fuel are for Catwa’s mesh heads. The Morgana appliers are some of the best I have seen for the Catwa heads and are so reasonably priced for everything you get. 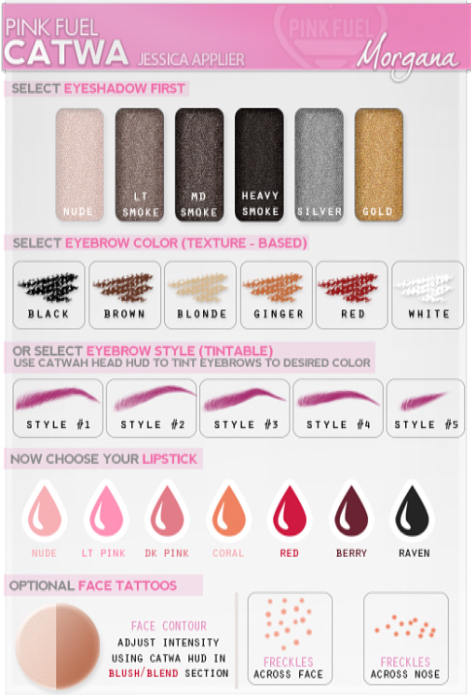 There are tons of options and absolutely gorgeous eye makeups in particular. I loved the Morgana system skin and I am definitely loving Morgana for Catwa. One of the things I am noticing is the wide disparity in pricing for appliers. If the appliers have no options beyond eyebrow color or similar, or paint the head one way in one tone, the price should really reflect that. Unfortunately they often do not. Also, personally I am done spending $1200L+ on appliers for any head; unless they have options for more than one tone. I am seeing more and more of these and it sets a bad precedent in the market IMO. Below you can see all the great options for the appliers from Pink Fuel. I highly recommend. My hair is perfect (ofc) and new from Elikatira at Fameshed. I haven’t visited yet because it’s been full for me – but you can find Nataline there when you get in! My clothes are from a new brand from Rowne called Jeune. I took a swing by and really liked the sleek pieces available so far. There is also a group gift available (shown here on the right), celebrating the launch of the line. ← Dressing for Fall …When it’s Still Hot Out?